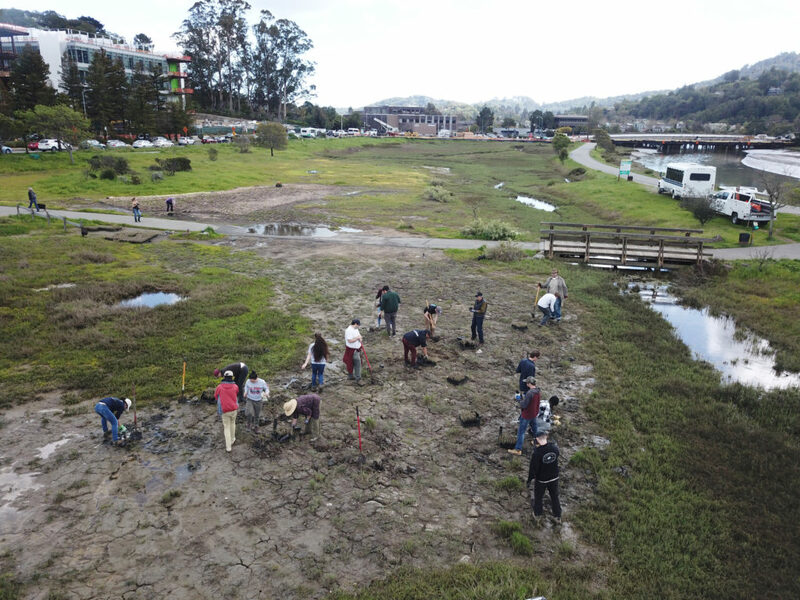 In late March, students from Professor David Larsen’s class pursuing Environmental Studies at CSU East Bay helped plant pickleweed at Creekside Marsh, one of Friends’ habitat enhancement projects. 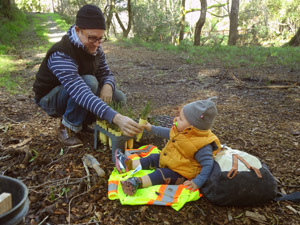 Earlier in the day, the class was given a tour of Corte Madera Creek and a sewer pump station by the Marin County Flood Control and Water Conservation District and the Ross Valley Sanitary District, a funder of the planting project. 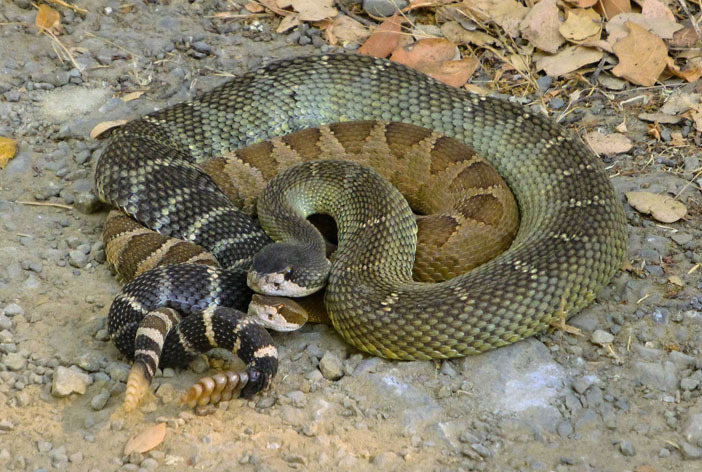 Photo courtesy of Ross Valley Sanitary District. Proper pet waste disposal is important for the health of wildlife and humans, and is a responsibility that comes with the enjoyments that pets bring us. Pet waste can expose humans and animals to bacterial infections and parasites, and adventurous children are especially vulnerable. If it reaches creeks and ponds, it can also promote algal blooms that are ugly and harmful to aquatic life. Waste can either be buried at least six inches deep in the soil (but not where vegetables are being grown) or put with household waste destined for the landfill—not in the green bin. 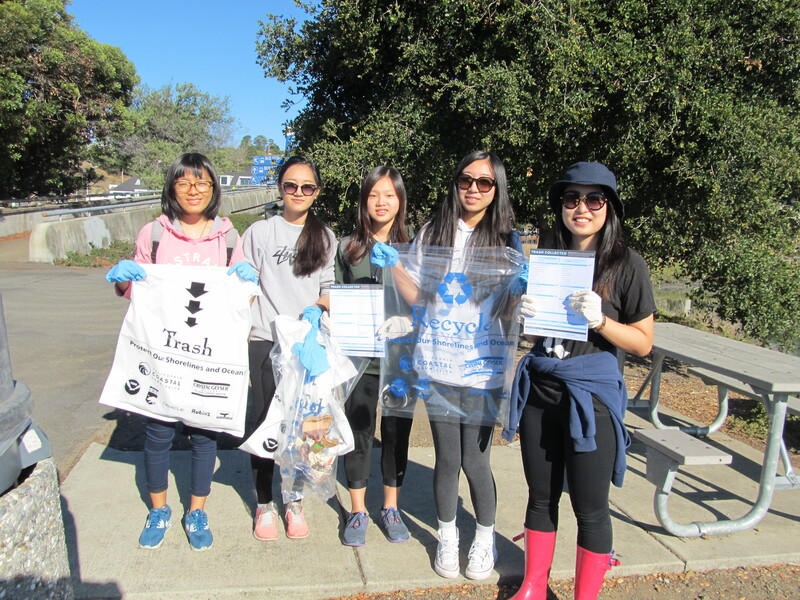 If you collect pet waste in the plastic bags provided at many trailheads, please finish the job and put it in a trash can, and not add to the plastic waste in the environment! 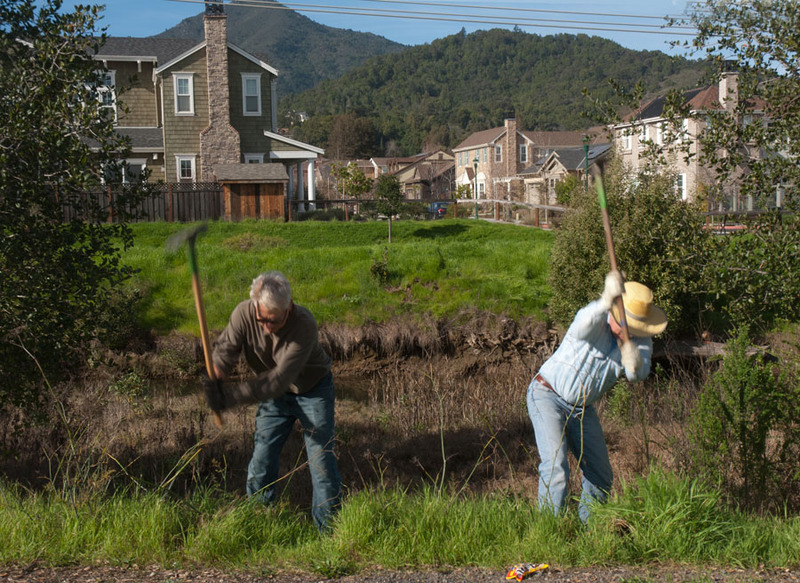 Friends of Corte Madera Creek Watershed supports the $4.4 billion California Clean Water & Safe Parks Act on the June state ballot. 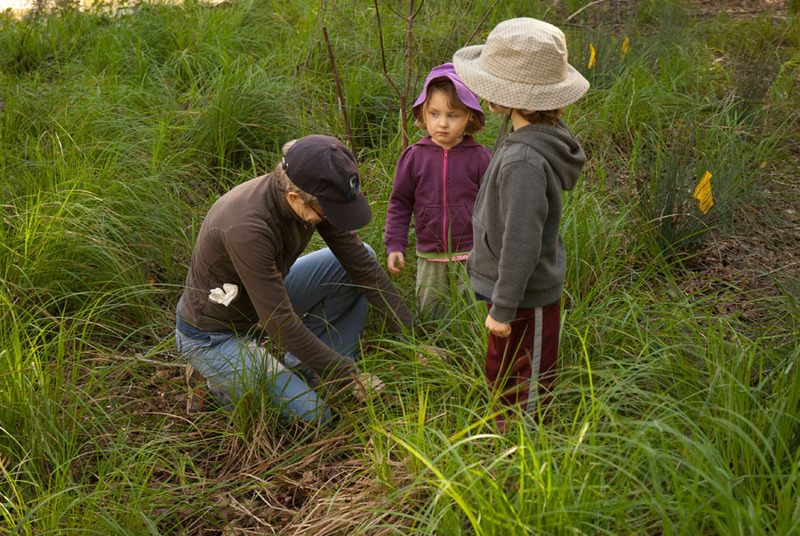 Prop 68 is a general obligation bond that invests $4 billion in the coming years to address some of California’s most important water, park, and natural resource needs. 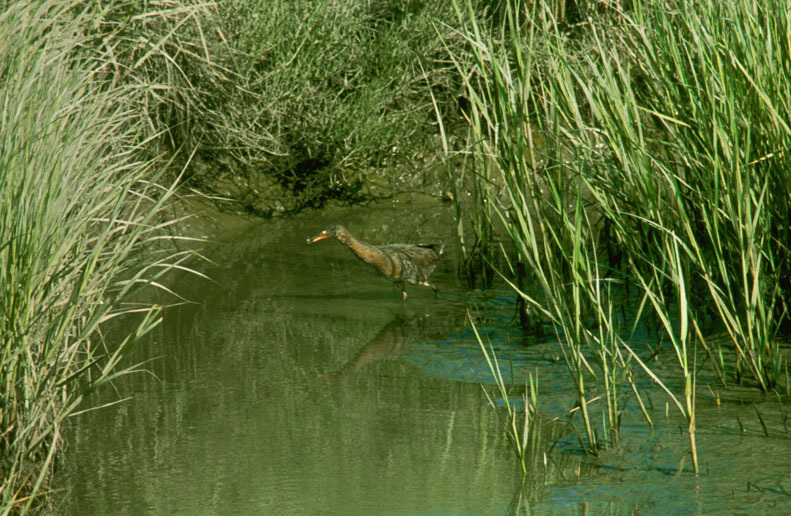 If you are nearby Corte Madera Creek’s estuary marshes and hear a sharp clacking sound, a Ridgway’s rail is in the vicinity, searching for crustaceans or worms, or minding its brood. The chicken-sized bird once numbered many thousands in the Bay Area, but is now listed as an endangered species owing to loss of its habitat. 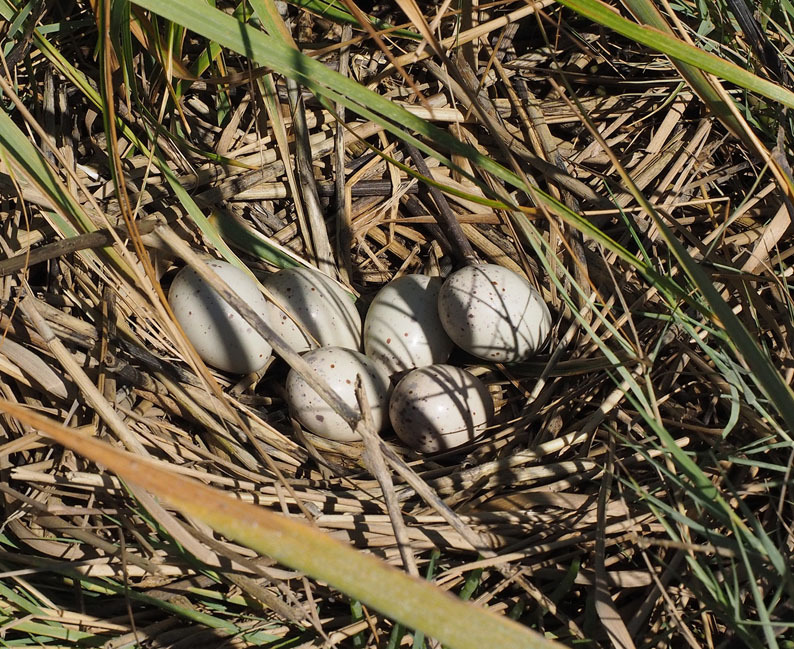 Hal Brown Park is a favored nesting site, and here Drew Kerr photographed a nest he accidentally came across in his work for the Invasive Spartina Project, which serves to benefit the rail as well as the salt-marsh harvest mouse, by removing the clumps of invasive grass. Friends of Corte Madera Creek has led the local program since it started in 2003. 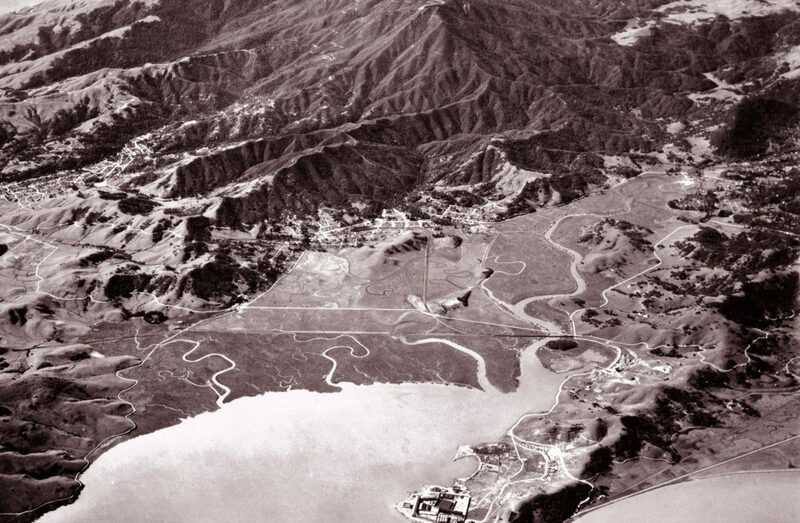 The Corte Madera Creek marshes were still largely undeveloped in the 1920s, when this aerial photograph was taken, looking towards the East Peak on Mount Tamalpais, at the top, center, with Larkspur at its foot. Crossing the marsh are seen the railroad, closer to the viewer, and “Tiburon Boulevard” which later became Hwy 101. The two hills in the center were levelled and became sites of the MMWD headquarters, and Redwood High School, respectively. Further up the valley, Bon Air Hill juts into the marsh. Photo courtesy of Anne T. Kent California Room. Friends board member Gary Leo lives by the creek in Fairfax, and is an avid observer and photographer of wildlife in his back yard and in the hills of his home town. 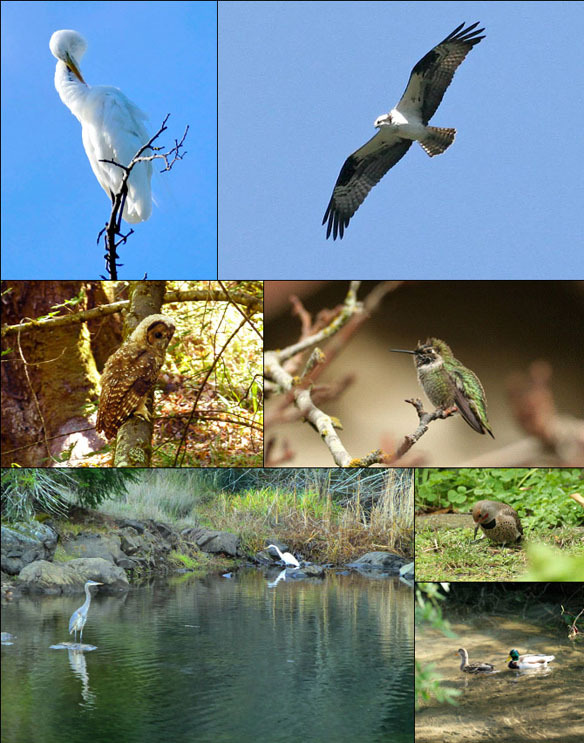 Seen here are, clockwise, from top left: great egret; osprey; Anna’s hummingbird; red-shafted flicker; mallards; great blue heron and great egret; northern spotted owl. Big Fish Caught on Camera! 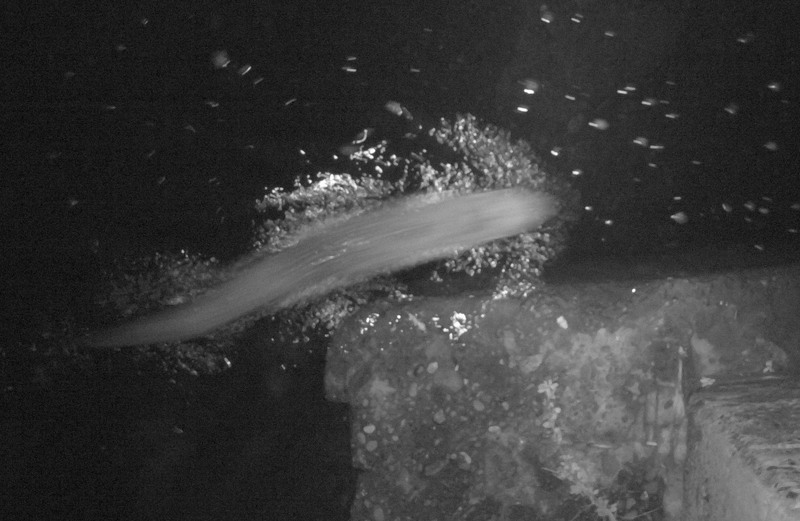 Thanks to Maureen Groper’s donation of a wildlife camera to Friends, we have a record of a very large salmonid passing Nokomis Bridge in San Anselmo in the evening of December 19. The fish was estimated by Eric Ettlinger, an aquatic ecologist with MMWD, to be over 40 inches long, and probably a steelhead, coming upstream to spawn. 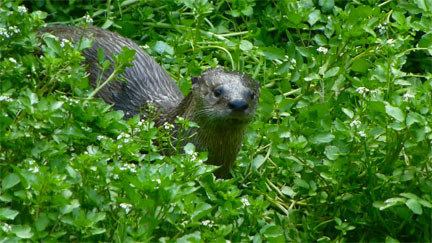 The camera, equipped with a motion detector, has also recorded an otter and several ducks. Friends president Gerhard Epke, who lives by San Anselmo Creek, has set up the camera in various locations near his home. Judy Coy of the San Anselmo Historical Museum has gathered newspaper reports and photographs of historical flooding in downtown San Anselmo and presents her findings on the museum’s excellent website Sananselmohistory.org/articles/flooding/. 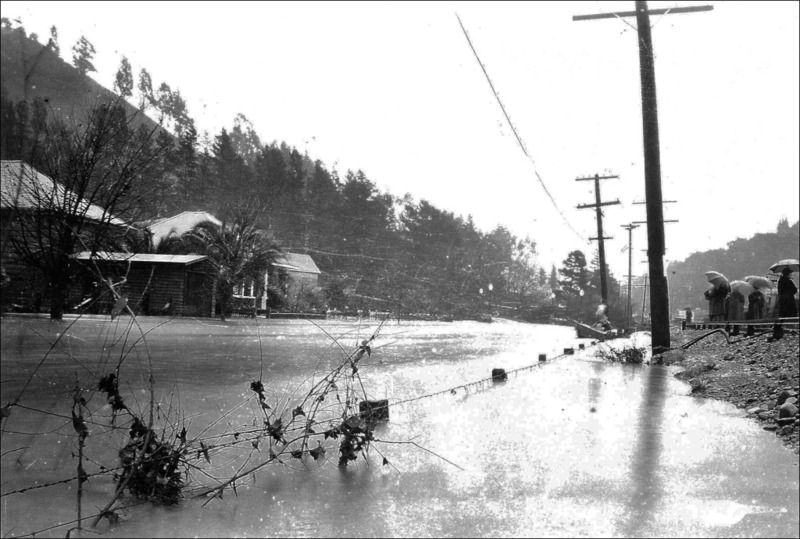 Nine floods between 1921 and 2005 caused considerable damage as well as excitement. 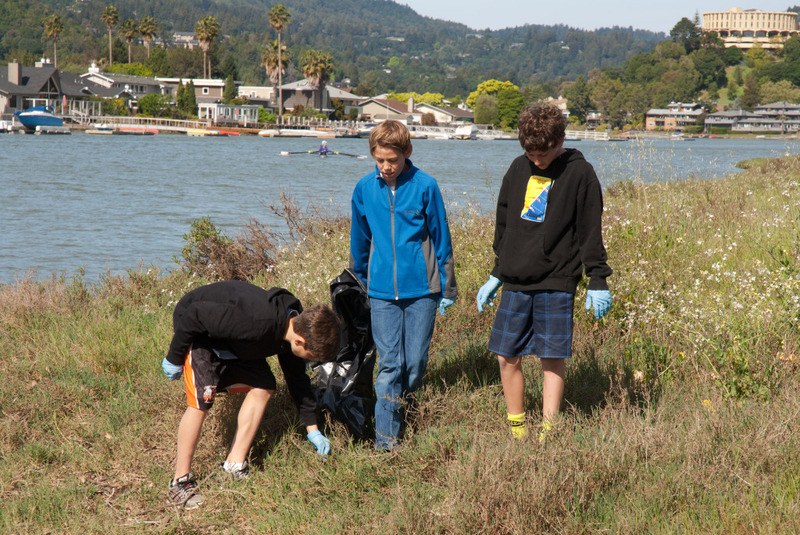 On April Fool’s Day nearly 80 students from Marin Country Day School spread out along the edges of Corte Madera Creek to gather litter from amongst pickleweed and saltgrass. Hardly any large pieces of garbage were found, but many small fragments were on their way to harming maritime wildlife in one way or another until they were picked up. Memorable finds were an unopened liquor bottle and two insulin syringes. 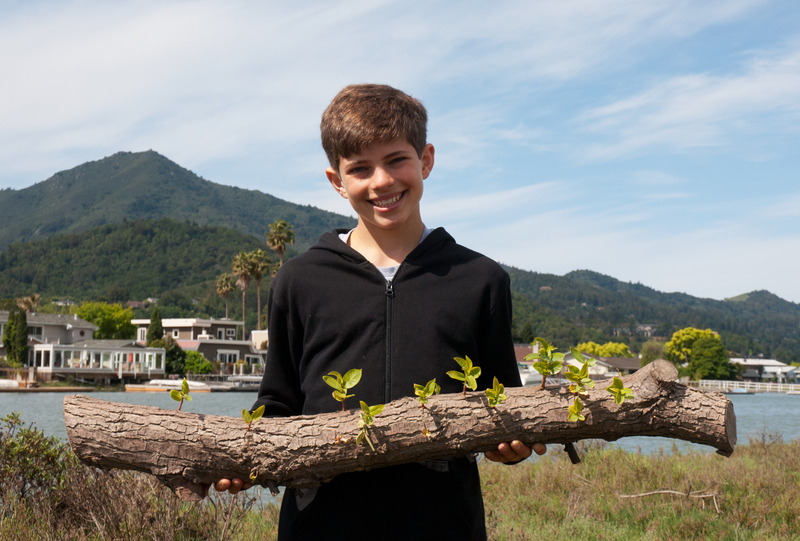 Make a tax-deductible financial contribution via PayPal or by sending a check to Friends of Corte Madera Creek Watershed, PO Box 415, Larkspur, CA 94977 Thank you! San Anselmo Historical Society Room, 110 Tunstead Avenue, San Anselmo. Contact us via email with news of events of interest, wildlife observations. or your concerns about our watershed.